Recently Skype has been opening itself or placing itself into focus, regardless of what app is running or on focus. This happens every half an hour to hourly. It's has gotten really annoying, and I have tried to rename the .app to .txt and move skype from Applications folder, however it won't let me change the extension (adds .app to the end of the name i.e. Skype.txt.app) and dragging skype to another location out of /Applications results in a alias being made. I've deleted Skype using AppCleaner, and I get this notification window indicating an error in opening skype, which meant that something is opening Skype, not Skype itself. The error window opens whenever the MBP is awakened from sleep, and during use of the MBP (as mentioned in the beginning of the post). Before I deleted Skype, I made sure that there was no relevant apps in the Open at Login window, and in iCal events. 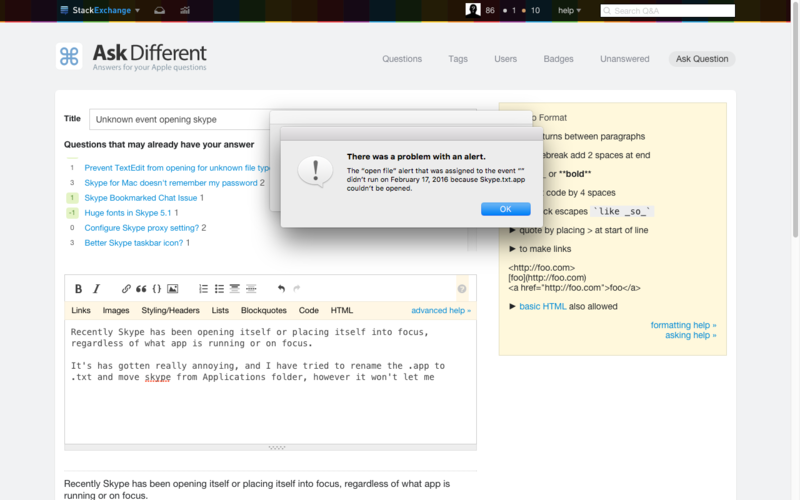 Two error windows opened when I went to continue typing this post, after waking up the MBP from sleep. The first window (behind) appeared after waking from sleep, and the second (in front) appeared at one of the half an hour to hourly openings. The cause for the pop up is CalendarAgent, however I cannot find the actual "open file" alert that attempts to open skype. I have posted a temporary solution, by disabling CalendarAlarm. However I would love it if someone can find a way to pinpoint a Calendar alert and delete it safely, as I use iCal to open and close certain apps at times of the day. Temporary Solution, however it disables iCal. put sudo launchctl list | grep CalendarAgent into Terminal and give it access to stop CalendarAgent. If you attempt to open iCal with CalendarAgent disabled, it will attempt to update it's calendars then crash. To restore CalendarAgents, type launchctl load -w /System/Library/LaunchAgents/com.apple.CalendarAgent.plist into Terminal and enter your password. Not the answer you're looking for? Browse other questions tagged macos applications calendar notifications launch-services . How to close applications on sleep?